Gynecomastia is a common condition in men and women where the breasts swell up and appear to be abnormally large. Not only women, but males even have breast glands but in most of the times they are not noticeable. But men suffering from Gynecomastia tend to develop an enlarged and noticeable breast which may be the reason for embarrassment when in public. It has been found that more than eighty percent of the total male population is affected by this condition. The male breast enlargement in males may affect the newborn, boys going through puberty, older men. However, for most of the people, it is seen that the condition has resolved naturally but later in life, it may increase again with age. Therefore, gynecomastia does not mean just the accumulation of the fat cells rather it also includes the enlargement of the breast tissues due to various factors like hormonal imbalance, heredity, and other factors. Gynecomastia actually results from a hormonal imbalance with an excess of female hormones estrogen compared to that of the male hormone androgen. The other cause of Gynecomastia includes steroidal medications, antibiotics, herbal medications, estrogen, etc. 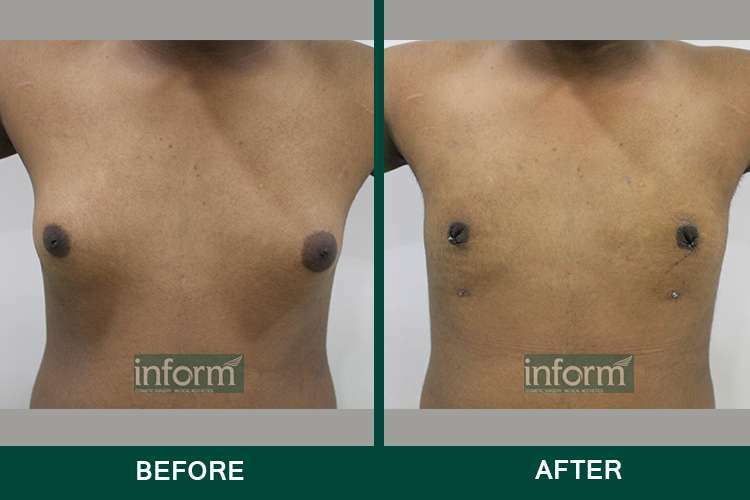 But here is a good news for all those people who are suffering from Gynecomastia. Gynecomastia surgical treatment is now available which can help to get rid of the enlarged male breast condition and embarrassment that they have to face. Men undergoing a Gynecomastia surgical procedure can get rid of their enlarged breast condition and boost confidence and self-esteem by achieving a flat masculine chest appearance. So it helps in an instant upgrade for a man who is suffering from a condition like this. For most of the men who are suffering from gynecomastia and is not comfortable with the appearance of the breast they have can undergoing male breast reduction which is probably the best option for them. This surgical procedure involves removing excess fatty tissues and glandular breast tissues from the breast area and allowing them to achieve a flatter chest and a more sculpted figure. The best part of undergoing a male breast reduction procedure is that they can achieve absolutely permanent results. But it is very crucial for the patients to maintain a healthy lifestyle in order to balance the achieved result. Often it has been found that men with large breast feel uncomfortable in performing certain activities like running, jumping. Reducing the breast size would allow men to feel comfortable in engaging in certain physical activities and help them to stay fit with the strong masculine body. Additionally, the male breast reduction may also improve the posture, thus providing a straight, tall appearance. There are various other treatment procedures that can effectively treat Gynecomastia but it is only this surgical procedure that is considered the best. The enlarged male breast condition can be treated either with liposuction or through tissue excision of glandular breast tissues. Liposuction is executed on men who have a huge amount of fatty tissues in the male breast. The most advanced liposuction techniques are considered most effective and a least invasive one. However, this liposuction procedure is performed under local anesthesia and involves making small incisions on each side of the chest. A large amount of medicinal fluid that is mixed with some anesthetic and is usually injected in the area of treatment so that the patients do not experience any major pain or discomfort during the procedure. Now depending on the needs and requirements of the patients, the incisions are made on portions that are around the edge of the areola or the area within the armpit. Through these incisions, the cosmetic surgeon is able to remove the excess glandular tissues in order to obtain the most natural appearance. In other severe cases of Gynecomastia, some patients may also experience no good result after undergoing a liposuction procedure. Such people must undergo a tissue excision procedure that includes eliminating the extra-glandular breast tissues to achieve the optimal results. The tissue excision procedure can also help people to get rid of the stretched, sagging skin around the breasts. In this cosmetic procedure, the cosmetic surgeon helps to remove a greater amount of glandular breast tissues or skin that cannot be successfully treated with liposuction alone. The surgeon involves making incisions in the area of treatment. The location, length, and extent of the surgery are needed but are typically located around the edge of the areola or within the natural creases of the chest. The male breast reduction with tissue excision is typically performed on an out-patient basis so the patients can return back home on the same day of undergoing the procedure. Immediately after undergoing the liposuction procedure the patients are not able to feel some major pain or discomfort. This is because some amount of liquid anesthetic still remains in the area of treatment which helps to reduce the post-procedural pain. For people who have undergone a tissue excision procedure, the incisions are covered up with dressings and bandages to support the new chest contour during the recovery period. After the surgery, the candidates mostly experience some immediate improvements in the shape and size of the breasts. The patients may feel some pain and discomfort which can be resolved with some medications and a compression garment is provided by the surgeon to support the new breast contour. The recovery period, however, may vary from person to person but on an average, candidates undergoing a liposuction or tissue excision procedure can return back to normal activities within few days. Vigorous activities must be strictly prohibited and that can be resumed after three weeks. The post-op instructions that are provided by the surgeon must also be followed minutely to continue a safe and rapid recovery. The results obtained are permanent and the excess fat, glandular tissues, and skin are removed permanently. But it is very important to maintain a healthy lifestyle in order to maintain the achieved result. Remarkable weight gain in the future, use of some steroids or certain other medical conditions can result in the recurrence of Gynecomastia. Gynecomastia through tissue excision procedure may result in scarring and that may give rise to some self-consciousness. Some people may not be able to achieve the desired result. Remarkable weight gain after undergoing the procedure may result in the recurrence of the same old previous condition. Overall the gynecomastia surgery is a safe procedure if the patient follows the post-op instructions that are provided by the surgeon. However, it may include complications like bleeding, blood clots, infection, and persistent pain, etc. These complications can be avoided by the patients by following the instructions provided by the surgeon. Gynecomastia is a condition of breast enlargement in men that can occur due to various reasons which may affect only one or both the breasts. It has been estimated that majority of the male population is suffering from Gynecomastia. It is not a condition that is associated with any physical illness but it can greatly impact the person’s mental health. Therefore, gynecomastia has been the reason for embarrassment and now there is a solution to get rid of the condition. Plastic surgeons now perform Gynecomastia surgical procedure here in Hyderabad that includes minimal scarring and pleasant aesthetic outcome. This surgical procedure helps to reduce the breast size in men and help them to accomplish the best-desired chest contour. Hyderabad has a large number of cosmetic surgeons who specializes in male breast reduction, body contouring via liposuction, tummy tuck, and other body contouring procedures. But when you get to choose the best cosmetic surgeon in Hyderabad, it would be best to choose Inform Clinic. 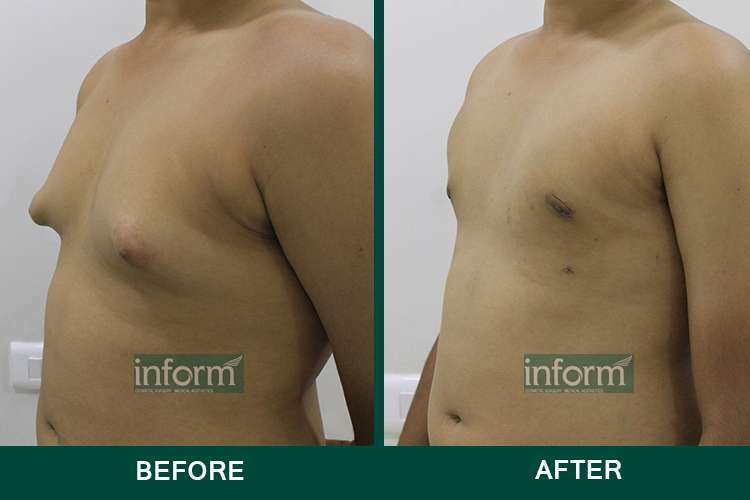 Inform clinic is one of the best clinics that can perform the best Gynecomastia procedure. This clinic is located on the 3rd floor in the Park view which is adjacent to the CVR Health, Road Number 1, Jubilee Hills in Hyderabad. This clinic is considered one of the best one in Hyderabad since it maintains absolute hygiene and a perfect treatment ambiance. The clinic has well-trained staffs who can provide the best services to their patients. The Inform Clinic is run by a group of specialized cosmetic surgeons which adds a feather to the crown. Therefore, choosing the best clinic in Hyderabad is probably the best option ever. Before undergoing the procedure it is very important to consult with an experienced surgeon who will evaluate and analyze the physical condition of the patients. The patients may also require undergoing numerous lab tests to verify their physical condition and eligibility to undergo this surgical procedure. Next, the surgeon may also provide with some pre-op instructions which the candidates must follow to avoid any complications that are related to this procedure. The pre-op instructions may include avoiding blood thinning medications, herbal supplements. Patients who are addicted to smoking are also instructed to quit smoking at least two weeks before and after undergoing the treatment. This is because the nicotine content in the blood can impair the healing capacity of the people. The patients are also instructed to avoid sunbathing two weeks before the surgery because that can increase the potential risk of permanent scarring. Usually, the surgeons evaluate the medical reports of the patients so that they can get a clear idea of the problem areas of the candidates. On the day of undergoing the Gynecomastia surgical procedure, some medications are administered to provide comfort during the surgical procedure. Normally this surgical procedure is carried on under local anesthesia so patients can easily return home after few hours of undergoing the procedure. The surgeon will instruct you to wear comfortable cloths on the day of the surgery. A compression garment will be provided in advance which must be worn right after undergoing the procedure. Immediately after undergoing the procedure, the patients are monitored closely to find any chances of risks and complications to pop up. The patients do not experience any major pain during the procedure, but they feel some pain when the anesthesia effect wears off. However, the surgeon provides with some medications for pain and some antibiotics to reduce the pain and swelling in the treated area. A compression garment is also provided to provide support to the new breast contour. Normally most of the people are able to undertake normal activities within one to two weeks of the procedure. Who is considered the best candidate for the procedure? In general, the ideal candidates for people undergoing Gynecomastia are those who are above eighteen years old. The candidates have to be in an overall good health condition with no major physical complications. Additionally, the candidates must quit smoking or alcohol consumption before undergoing the procedure to enjoy a complication free result. The candidates undergoing the surgical procedure is experiencing embarrassment about his breast condition and is desperate in resolving such condition. Gynecomastia basically occurs due to the effect of hormonal imbalance on growth or aging. Other factors that drive Gynecomastia is mostly due to the effect of medications, drugs, etc. What are the treatment options available for Gynecomastia? The Gynecomastia treatment options include topical creams and lotions, some other medications, etc. But in majority cases, the patient does not experience any effective result from such treatment. It is only a surgical procedure that can actually fetch the best-desired results. The cost of Gynecomastia surgery mostly varies on various factors like the procedure undergone, the liposuction technique chosen, the anesthesia fees, the geographic location of the clinic, the number of glandular breast tissues to be removed, the experience and reputation of the surgeon. Normally, the surgery takes one to two hours to complete. Patients may wish to undergo liposuction or tissue excision procedure or both of it. What are the risks and complications that are associated with Gynecomastia? Like any surgical procedure includes some amount of risks and complications in the procedure, similarly, the surgical procedure to includes some major complications like pain, bruising, swelling, tenderness, lack of sensation in the treated area, infection. But the best part is most of the side effect are temporary and self-resolving. What are the lifestyle changes that the patients must bring after undergoing the procedure? The results obtained in this procedure is permanent, but the candidates must know that unless they lead a healthy lifestyle the candidate will not be able to maintain the obtained result.